I would like to see the ability to select multiple notes and then be able to access the notes properties to change tags or folders in one shot. In addition, there needs to be a properties dialog box for a note so I can actually see the tags in a list. I have multiple tags per note and you can barely read one, let alone multiples on the screen. 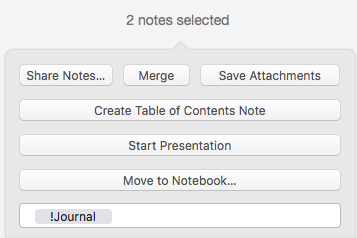 EDIT: I can change the notebook through a right-click and then move or copy. I missed that when I was looking for it. Still no way to change tags that I can see. Hi. 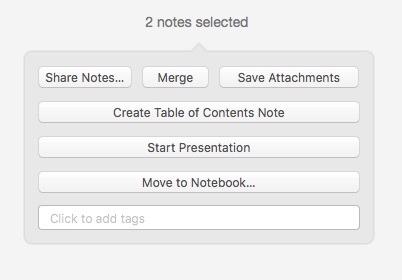 If your multiple notes have different multiple tags, any tag display is going to be a mess. In List view you can see as much detail as you have screen real estate by adding or removing columns and changing their width - isn't this enough? It's easy enough to select multiple notes and apply a temporary tag so a search will isolate that group in your list.. Not saying your request isn't valid - just maybe my bad that I don't fully understand the need. When I open a note I would like to have an option to pull up a properties screen on it. It would allow me to change the note title, the folder, and the tags. The tags assigned would be listed out so I could see them all. Currently when I look at a note I can only see one tag and only part of it. Nice to have this on mobile platforms too. Currently trying to change tags is a pain. The other item is setting tags on a group of notes. For example, I made some changes to my tag structure. I have a large number of notes that need one tag applied to them to replace their current tags. In most Windows or Mac programs I could select them all and pull up the properties for the group. Changes would be limited to common fields such as tags or folders. Just like in iTunes... I can select a group of songs and set the artist, album, genre, etc to all at once. You can add tags and move notes for multiple notes. Select multiple notes from the list (cmd+click) and you are presented with a number of options. I too have a need for this. For example: I have an IFTTT recipe to create a daily journal note to which I add information throughout the day. I have a number of tags on it and two years ago one tag was "2014". I stupidly forgot to change the IFTTT recipe this year so all my 2015 notes have the wrong tag on them. 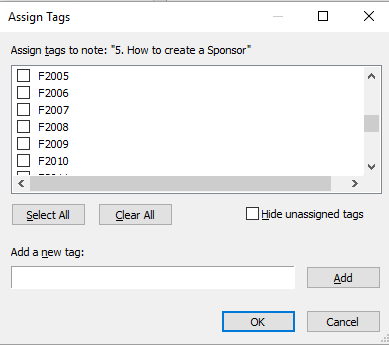 I sorted and selected the group created in 2015 and got a dialog box which will allow me to ADD the 2015 tag but I can't remove the 2014 tag. I figure there MUST be a simple way to do something so obviously needed but I can't find it. What am I missing? NOTE: I realize that there are other ways to skin this particular cat. I don't really need that tag at all, for instance, I can just find 2015 notes using the create date. But it is just an example from what I'm trying to do this morning ... clean up my tags. Another example is making a typo in a tag ... impossible to correct except one at a time, so far as I've been able to see. got a dialog box which will allow me to ADD the 2015 tag but I can't remove the 2014 tag. My understanding is that when you select multiple notes, the dialog box shows all the tags in common with the selected notes. Using that box, you can delete the tags. Im this example, !Journal was a common tag, and I can delete it. For those resisting the dark side, it's Ctrl ⌘ T on the Mac, and not as functional. Not sure whether it's relevant to the discussion, but in regard to typo tags or unnecessary ones, remember that you can also edit a tag if it's attached to the correct note(s) but just badly spelled; or add the correct tag and delete the incorrect version if it's just wrong.